Welcome my dear friends! I am humbled and honored to be joining a creative and talented group of ladies for the Sparkle Home Christmas Tour, organized by Debbie at Chatham House on the Lake. We are all so excited to welcome you into our holiday homes! For those of you who are visiting for the first time, welcome! My name is Lynne and I am a Connecticut wife, mother of two teens, and a full-time elementary school teacher. My Family Thyme has grown out of my love for cooking, crafts, décor, and all things home on a budget. I would be so grateful to keep in touch with you! Please consider subscribing to my email list. You may also want to follow me on Instagram, which is my favorite place to share! We can also pin together on Pinterest. 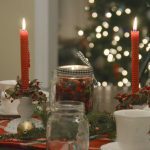 Christmas is just around the corner…and here in New England, I’ve dressed up my colonial home with simple, natural, and traditional elements…while staying on a budget. Wreaths are on the front windows, candles in the windows, and we are enjoying all of the sights, sounds, and scents of this season. Friends who knows me and my family well, know to come to our back door. Come right through our screened in porch and into the kitchen. Welcome! A couple of years ago, we had some MAJOR ice damming, which resulted in an unexpected kitchen remodel. While it wasn’t fun to go through, we are so grateful for this room. It is truly the heart of our home. Due to the porch, this room does not get a great deal of light. As a result, we went with bright white cabinets and neutral accents. My daughter, Elisabeth, helped to pick out many of the elements in the kitchen. It really was a family effort! I love bringing nature into our home. 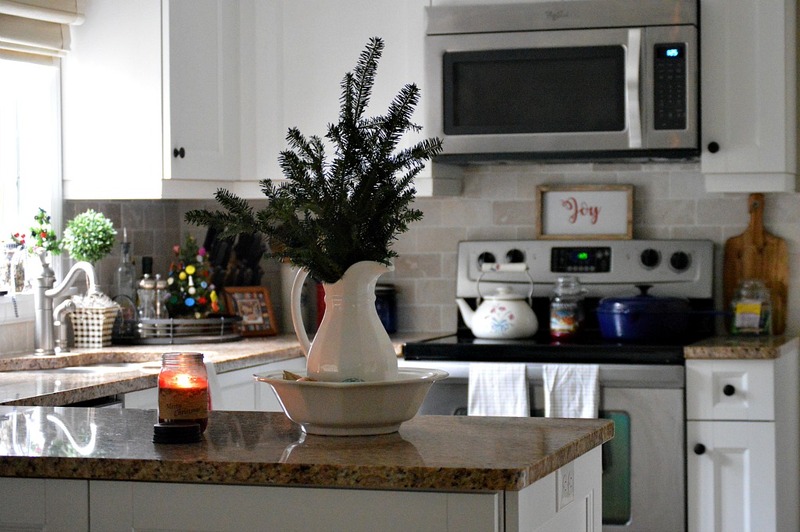 For the holidays, these evergreen branches from our local Boy Scouts are the perfect addition to our kitchen. The fragrant scent of pine fills this room. Next to the sink is a tray from Home Goods, with a homemade Christmas tree that my daughter made many years ago. I tend to be very sentimental and keep all of the homemade treasures from years past. To add some Christmas spirit to this room, I have added a fresh boxwood wreaths to the window and door from Trader Joe’s, complete with festive ribbon. You can imagine my surprise when I found out that I was fortunate to win a wonderful giveaway on Instagram from Dixie Do Designs. If you don’t know them, you should definitely check out this talented couple who make beautiful handmade signs. 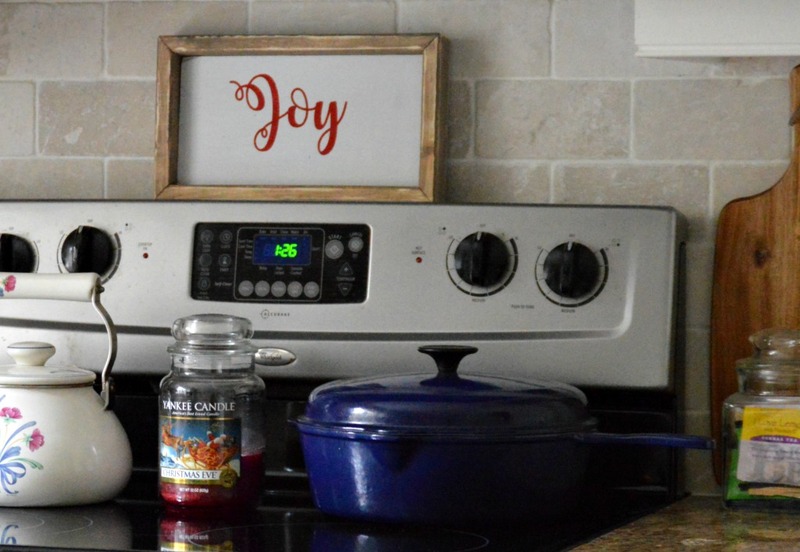 This “Joy” sign with the with the rich red script brings some holiday cheer. Being in New England, warm drinks are essential after an afternoon of sledding, skiing, or just enjoying our winter weather. 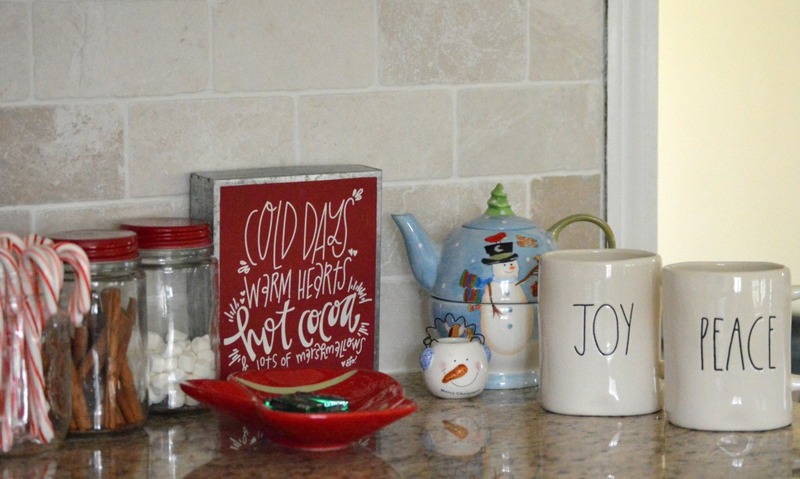 I have set up a little “Hot Cocoa” bar, complete with some fun snowman décor and a festive sign from Hobby Lobby. Candy canes, marshmallows, cinnamon sticks, and Andes Candy (what are left after my children discovered them!) are delicious additions to a mug of cocoa. These Rae Dunn mugs were also part of that generous giveaway from Dixie Do Designs. I love their sweet messages and their farmhouse feel. 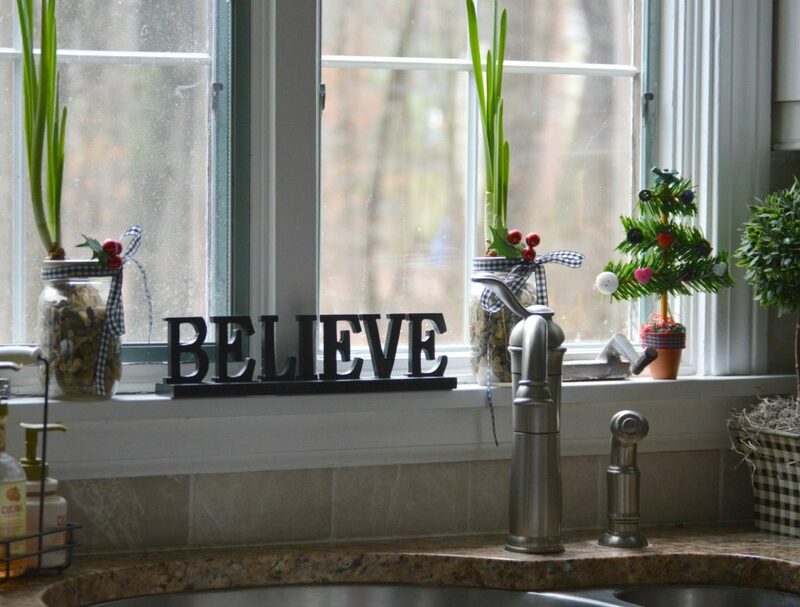 On our window kitchen windowsill, you will find some paperwhites are growing in preparation for a holiday bloom. Please see Paperwhites for the Holidays to learn how easy they are to grow. They make great gifts too! Along with the paperwhites, another childhood decoration adorns the windowsill. This sweet homemade tree is made out of a pencil. So cute and clever! Let’s head down the hall and into the family room. Along the way, you can check out our chalkboard. This is a great place to add some seasonal inspiration to our home. Lines from a favorite Christmas hymn decorate this thrift store chalkboard. 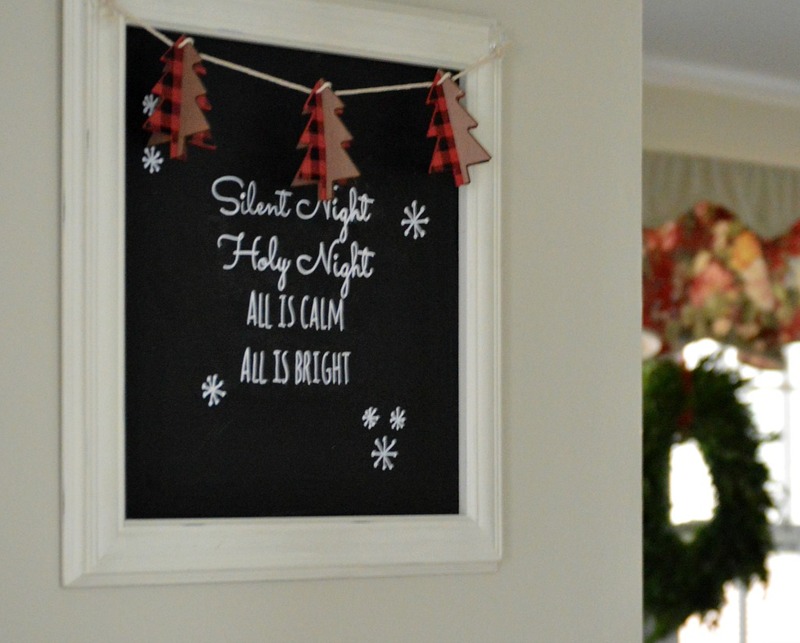 Please check out Christmas Chalkboard Art for a free printable, with a step by step tutorial. I added some fun buffalo plaid Christmas tree garland that I found at Target’s dollar spot. Our family room is the room that sold me on our home. I love the large window that brings in streams of natural light. Wood paneled walls and ceiling, along with wide planked wood floors make this space so cozy. These stockings, belonging to my children and our dog, are joined by a Noel sign, found at HomeGoods, along with some fresh greens from our yard. A couple of picks from Michael’s, a painted candlestick from Goodwill, topped with a red candle, and some white lights complete the mantel. 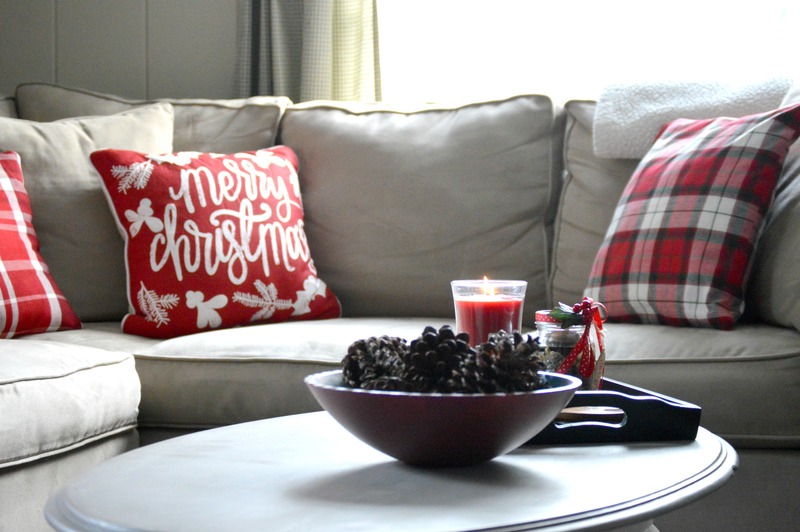 A cozy blanket, along with plaid pillow covers made from napkins for just $3 each, add pops of holiday colors! I found this festive Merry Christmas pillow at Target last year. A bowl of pine cones, along with a tray complete with a seasonal candle, a Santa box, and another paperwhite bulb decorate the top of this DIY Coffee Table Refinish . To add some more holiday cheer to this room, I have added fresh greenery from our yard. 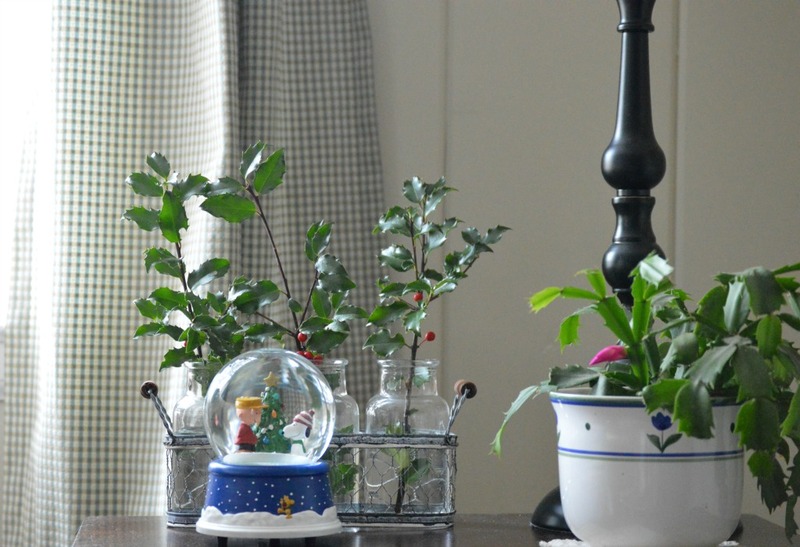 A mixture of boxwood, holly with berries, and faux berries bring natural colors of the season. One of our favorite Christmas specials is Charlie Brown’s Christmas. This Peanut’s snow globe is a family favorite. 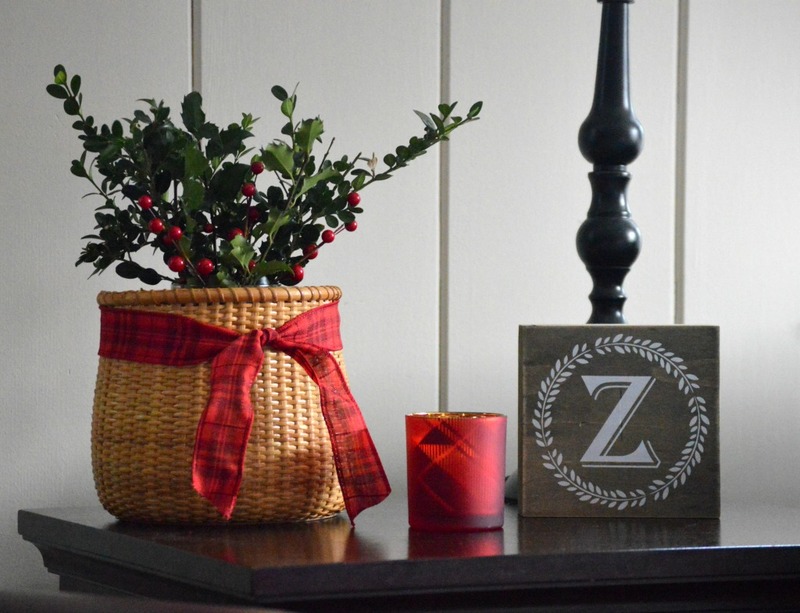 Accented with our Christmas cactus, as well as more fresh holly and berries from our yard, it brings a personal touch to our holiday décor. Decorating around the television can be a challenge. 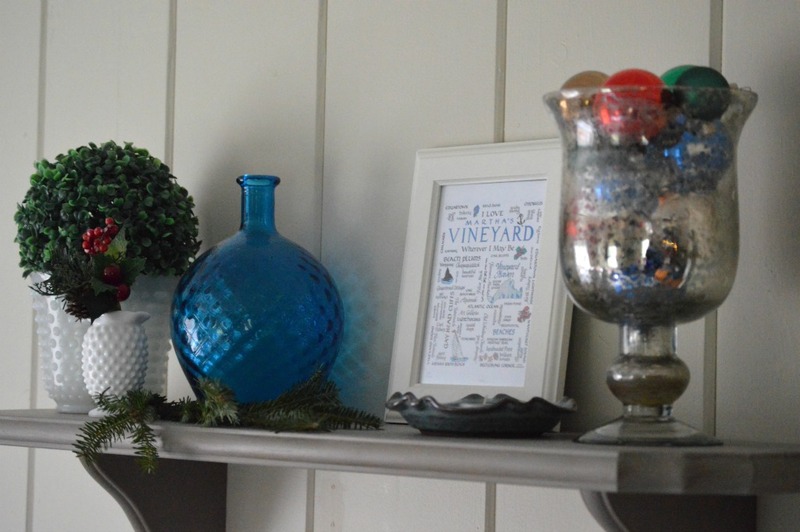 This past summer I hung this shelf, decorated with items from our favorite vacation spot…Martha’s Vineyard. For Christmas, I just added some colorful bulbs we had, along with some more fresh greens, and a festive holiday pick. What are some of your favorite ways to add touches of Christmas to your home? I would love to hear some of your thoughts and ideas! Thank you so much for stopping by! Please come back next week and join me to see a few more rooms dressed up for the holidays. In the meantime, enjoy all of the amazing homes on the Sparkle Home Christmas Tour! Warm wishes for a very Merry Christmas from my family to yours! The fresh greens from your own yard are wonderful. Fresh greens are so pretty, not to mention the scents. When I retire south I don’t care much about the house, but I want a gorgeous yard with mature hedges, trees, etc. Lovely home tour, I will be back to see more. I appreciate you and your kind words, Leanna! I love gardening and bringing the outdoors in. Best wishes for a very Merry Christmas! Your kind words are so appreciated, Susanne! Best wishes for a very Merry Christmas! What a beautiful tour. Your home is so cozy and does say come on in and visit. 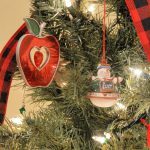 The handmade and treasured ornaments that you bring out each year mean so much and make this season so special. Thank you so much, my friend. I so appreciate your kind words. 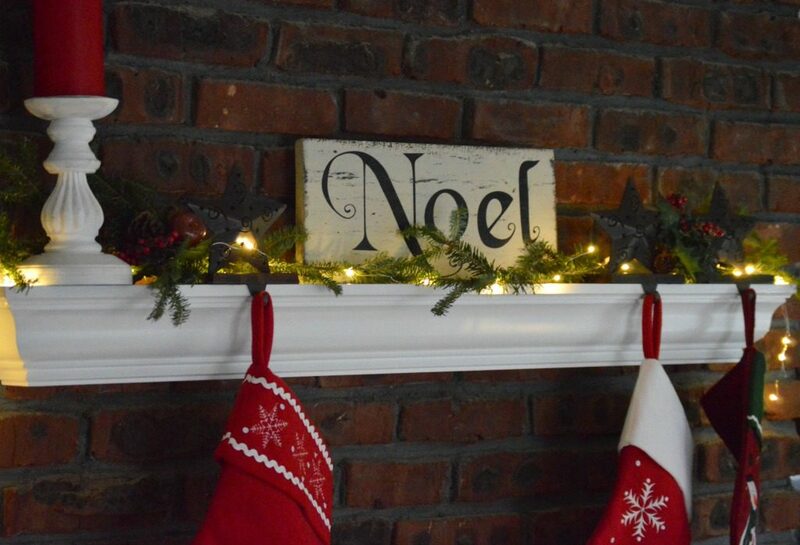 It’s the homemade and sentimental decorations that really make a house a home. Wishing you a very Merry Christmas! Your home looks very cozy and inviting. I can imagine having a cup of hot chocolate, sitting on the lounge chair, catching up with friends. There are so many lovely bits and pieces from the cushions to the chalkboard, the signs and ornaments. Thank you for sharing. Wishing you a very Merry Christmas. Your kind words are so appreciated, Fiona! Best wishes for a very Merry Christmas! Beautiful rooms, and I love the hot drink station. I know Johnny wants to have one, I just need the time and the stuff. Thanks for sharing your wonderful home. Thank you so much for your kind words, Pamela! Best wishes for a very Merry Christmas! Lynn your home looks so inviting, love the country decor. I appreciate your kind words, Marjan! Best wishes for a wonderful holiday season! Your home is simply beautiful! I especially like the pillow covers made from napkins and the paperwhites. I’m sitting in my living room and right in front of me is our Peanuts Christmas tree, complete with one red ornament and blue tree skirt- I can definitely appreciate your snow globe! Great job! Your kind words are so appreciated, Melony! Your Peanuts Christmas tree sounds so sweet! Wishing you a very Merry Christmas! Lynne, I love all of your Christmas sprinkles through your home! So cozy and inviting! You are so clever to have turned those napkins into fabulous festive pillows! I have really struggled to find Christmas pillows and may have to borrow your wonderful idea! Wishing you and your family a very Merry Christmas! Thank you so much for sharing your home with us! Thank you so very much for your kind words, Sam! I appreciate them so! Best wishes to you and your family for a very Merry Christmas! Lynne, thank you for sharing your home and beautiful decorations. I like how the kitchen is set up so inviting and festive for the holiday season. I appreciate your kind words, Jasmine. Best wishes to you for a very Merry Christmas! Everything is so simple and natural, yet it makes your home feel cozy and nurturing. 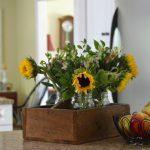 Your kitchen in particular just shines with your homemade treasures and simple displays of greenery. (I know it’s not part of the tour, but I am so drawn to your red floral valance in the window. I am trying to get up the courage to sew red floral print curtains for my kitchen windows; but now I have inspiration!) 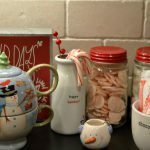 I loved that snowman pot on the Cocoa Bar, and also the stockings for your children….AND your puppy! Best wishes to you and your family for a wonderful Christmas! Thank you so much for your kind words, Kristine! I am so appreciative! 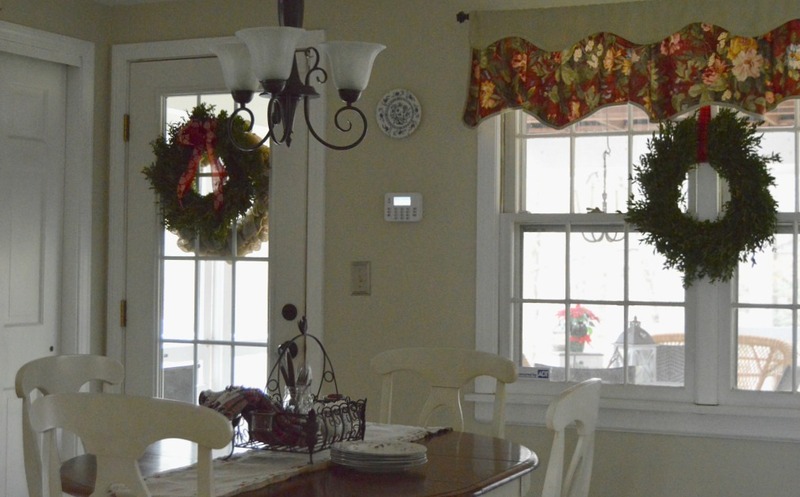 The red valance was a Country Curtains purchase many years ago. I love their items because they are so classic and timeless. Best wishes to you and your family for a Merry Christmas and a beautiful holiday season! Lynne!!! I need to come up and visit. Your home is cozy and amazing. I love all the fresh greenery. I love this time of year when my Christmas cactus blooms. Yours will be going crazy with blooms really soon! I simply must try the Paper Whites next year. Will reference your tutorial. Love your pops of red and the napkin pillows. Can’t wait to see your home in part 2. Thanks for inviting me in. Merry Christmas, my friend! I would love to have you come and visit, Melissa!! You are always welcome. Thank you for your sweet and thoughtful comments! They are appreciated more than you know. Merry Christmas to you and your family! I love your decor everything looks so pretty. That pillow from Target is beautiful. They have something new and lovely each year. We love Charlie Brown Christmas too and I think it would be fun to have something from the story. Your home is beautiful!! Thank you for your kind words, Zan! I am very appreciative! Best wishes to you and your family for a very Merry Christmas! Lynne, I love all of your cute signs throught the house but I especially love the simple displays you’ve created with jars. Candy canes, cinnamon sticks give a great display and I’m sure some great smells in your kitchen as well! Thank you for opening up your home to us! Merry Christmas! I appreciate your kind words, Michele! Best wishes for a very Merry Christmas!